we are going to see how to use SVM classifier in python. Our Demonstration uses digit dataset . This dataset uses 64 feature vector to identify handwritten digit [0, 1, 2, 3, 4, 5, 6, 7, 8, 9] . It means this 64 feature extracted from Handwritten digit used to classify handwritten digit in 9 classes . So Again we gonna use skilearn Python Package . 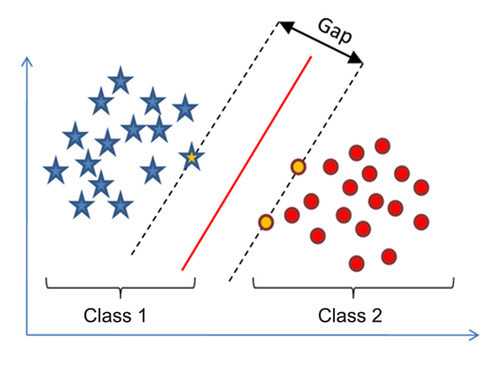 Lets see some about Some of Parameter of our classifier that is used to customize our classification . We discuss only few most useful parameters . kernel : Used to convert low dimensional feature space to high dimensional space in order to make it separable. example : rbf,poly,leaner. C : Controls trade off between smooth decision boundary and classify training point correctly. High value leads to over-fitting that is not good for generalisation. gamma : Defines how far influence of a single training example reach. (high value of gamma leads to over fitting) so for generalise classification we need low value of gamma . Others Parameters are : cache_size, class_weight, coef0, decision_function_shape, max_iter, probability, random_state, shrinking, tol, verbose . From this figure you can see the Difference . But real question is which situation is good. And Answer for this problem is figure1 . Overfitting Situation is not good but it looks like that it will gives better result . but when you will apply this classifier for general new data you will see that performance of over fitting is less then proper fitted hyperplain . Hyperplain : Line or plain in n dimensional space that is used as boundary of classification .